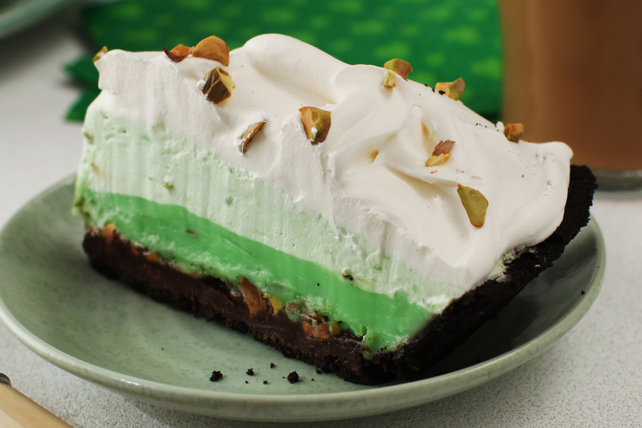 Add a fun green twist to your St. Patrick's Day menu. All the kids including Dad! Combine baking crumbs and butter; press onto bottom and up side of 9-inch pie plate. Refrigerate 30 min. Mix chocolate and condensed milk until blended. Spread onto bottom of crust. Sprinkle with half the nuts. Refrigerate until ready to use. Beat pudding mixes and 2% milk with whisk 2 min. (Pudding will be thick.) Spread 1-1/2 cups over chocolate layer in crust. Stir half the Cool Whip into remaining pudding; spread over pudding layer in crust. Top with remaining Cool Whip and nuts. Enjoy a serving of this delicious treat on special occasions. Store leftover sweetened condensed milk in tightly covered container in refrigerator up to 1 week. Serve over cut-up fruit or hot cooked oatmeal. Or for extra flavor, stir into your cup of hot brewed coffee or tea instead of regular milk.